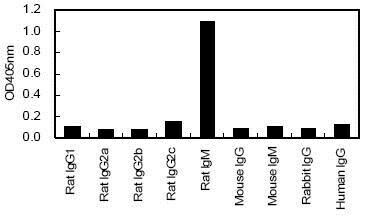 Full length protein corresponding to Rat IgM. ab170327 is purified through a Protein A column and labeled with horseradish peroxidase. Our Abpromise guarantee covers the use of ab170327 in the following tested applications. Dilution using DAB as substrate. More dilution is needed for ECL system. Isoform 1: Secreted. During differentiation, B lymphocytes switch from expression of membrane bound IgM to secretion of IgM. Isoform 2: Cell membrane; Single pass type I membrane protein. ELISA for crossreactivity of ab170327 to various immunoglobulins. ab170327 has not yet been referenced specifically in any publications. Publishing research using ab170327? Please let us know so that we can cite the reference in this datasheet. There are currently no Customer reviews or Questions for ab170327.